The Orionids is an average shower producing up to 20 meteors per hour at its peak. It is produced by dust grains left behind by comet Halley, which has been known and observed since ancient times. The shower runs annually from October 2 to November 7. It peaks this year on the night of October 21 and the morning of October 22. The nearly full moon will block some of the fainter meteors this year, but the Orionids tend to be fairly bright so it could still be a good show. Best viewing will be from a dark location after midnight. 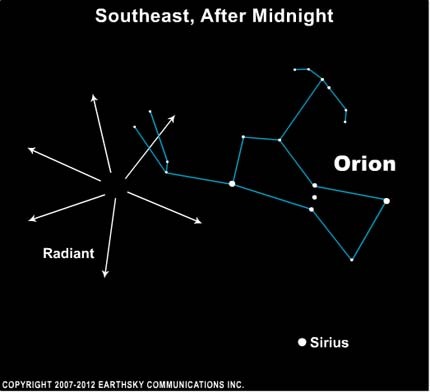 Meteors will radiate from the constellation Orion, but can appear anywhere in the sky. The Orionids are known to be fast and on the faint side, but can sometimes surprise you with an exceptionally bright meteor that might break up into fragments. As is usual for most (but not all) meteor showers, the best time to watch the Orionids is in the dark hours before dawn. Meteors are fancifully called shooting stars. Of course, they aren’t really stars. They’re space debris burning up in the Earth’s atmosphere. Particles shed by the comet slam into our upper atmosphere, where they vaporize at some 100 kilometers – 60 miles – above the Earth’s surface. The Orionids are extremely fast meteors, plummeting into the Earth’s atmosphere at about 66 kilometers – 41 miles – per second. Maybe half of the Orionid meteors leave persistent trains – ionized gas trails that last for a few seconds after the meteor itself has gone.